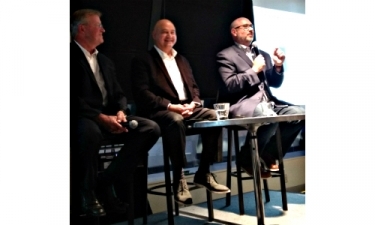 Schneider Electric’s Rich Korthauer, left, moderated a connected home session with homebuilder executives Jacob Atalla of KB Home and Brad Conlon of DR Horton. During Schneider Electric's Innovation Summit North America in Atlanta, builders discussed how they deploy smart home technology in the homes they construct, and how they remain largely bullish on the residential market for 2019. According to one session titled, "Building the Connect Home Today," moderated by Rich Korthauer, vice president of Schneider Electric’s Final Distribution Business, builders said they are continuing to adopt lifestyle-enhancing smart home devices. Korthauer cited research statistics that project an installed base of some 40 million smart thermostats in North American homes by 2020, with more than 4.5 million smart meters shipped in that same time frame. “This isn’t a matter of wait and see. Homes are being connected,” he said. The builders describe a strong construction backlog, with the pool of homebuyers now including lots of Millennials — and single females among them — who seek residences in suburbs with easy access to urban centers. And while most homebuyers today may not understand much about the underlying technology behind smart devices, they most certainly expect to see it deployed in new residences. “What has changed today is really the onslaught of the iPhone and Android in the consumer’s hand and the ability to easily open a box and things intuitively work for people,” explained Conlon. Atalla notes the introduction of the Nest thermostat as a significant home automation tipping point, as well as voice assistants, such as the Amazon Alexa. The devices are fueling expectations from the customer who desires more system compatibility with their voice assistant. Voice assistants, he said, are proving to be a great enabler of home automation functionality without having to utilize apps. In recent years KB Home has experimented with offering base packages of connected home devices and related technologies, and in the process learned a very important lesson: Don’t expect to applaud the consumer on their purchase and be done with the sale — not if ensuring their ultimate satisfaction is a tenet your company aspires to. “We learned if we go to the customer and say, ‘Here is your package, congratulations on the house, good luck with it,’ that’s not going to work. What we needed was a white glove service that comes to the home after they have Internet connected,” Atalla explained. Leaving the consumer to fend for themselves to connect and integrate the devices is a recipe for much frustration. Conlon also stressed the same point, stating connected devices are not necessarily intuitive for most consumers. You can expect they will need assistance in not just connecting the devices but also helping them become familiar with the various automation functionalities. Low-voltage integrators and electricians would be wise to stay clear of participating in a home automation program that does not include personized, follow-up servicing, Conlon said. Similar to KB Home, DR Horton has recently moved headlong into promoting the connected home as a mainstay of its sales and marketing program. Each of the 62,000 homes the company built this year included a base package containing a suite of smart home products: Qolsys IQ2 panel, Alarm.com platform, Honeywell T6 Pro Z-Wave thermostat, Amazon Echo and Echo Dot, Kwikset SmartCode 888 door lock, Eaton Z-Wave lighting control switch and Skybell smart video doorbell. Conlon said the firm examined the idea of devising an all voice assistant-controlled offering, but that idea was eschewed due to potential privacy concerns by some consumers. “We did not want to waste money on something that isn’t going to have them feel good about their home-buying experience. And so what we needed first and foremost was a software platform that was going to control everything,” he said. This article originally appeared on our sister publication, Security Sales & Integration.